Consider exactly how valuable those added features in the Touring and Touring Elite are. There's more than a $10,000 price span between the base LX and the top of the model line. The 2012 Honda Odyssey is the priciest of the minivans, but innovative seating and excellent handling set it apart from all the rest. 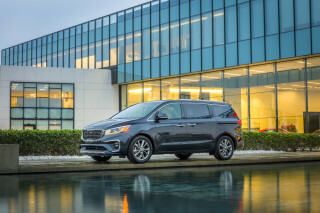 Honda completely redesigned its Odyssey minivan last year, giving this near-perfect family vehicle a more detailed look, improved seating, and new connectivity and entertainment features. 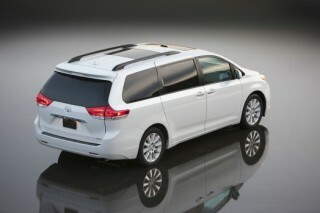 For 2012, Honda has addressed one of our chief complaints with the launch of the redesigned Odyssey last year. Honda was aiming to move on from the Baby Boomer crowd and extend the Odyssey's appeal to a younger crowd of new parents in their 20s and 30s, yet the new Bluetooth, connectivity, and infotainment features that this more tech-savvy crowd especially values were only offered on top trims. This year, Bluetooth, a USB interface, 2 GB of music storage, and the i-MID information display are included in all but the base LX. 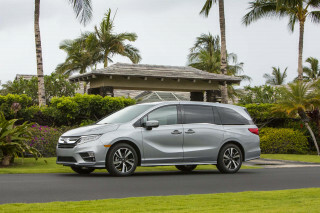 Minivans are the shape they are because the boxy proportions maximize space and the rounded edges and rakishness help aerodynamics and highway gas mileage, but Honda has managed to make the latest Odyssey a little more interesting in the details. While pictures don't always do the new lightning-bolt beltline, which drops the window line a bit behind the sliding door, justice, we think the new cue adds style as well as function—giving third-row passengers a bit more window space while accommodating the thicker back pillar that's common to other Hondas like the CR-V. Climb behind the wheel of the 2012 Honda Odyssey after doing the same test-drive route in an SUV or taller crossover, and it's likely you'll become a minivan convert (or rediscover the van). The Odyssey has always been one of the most responsive-driving and cleverly packaged minivans, and neither of those aspects have changed. You can drive an Odyssey on tight, twisty roads with the same verve as you would a sporty sedan, and handling is top-notch. The Odyssey has strong acceleration from the 247-hp, 3.5-liter i-VTEC V-6 engine; top Touring and Touring Elite models of the new Odyssey get a new six-speed automatic transmission, while the rest of the line does just fine with a five-speed. Odysseys with the six-speed are a little bit better on gas though, with ratings up to 19 mpg city, 28 highway, but all Odyssey models now have Variable Cylinder Management, to save gas, and active noise cancellation, to bolster the Odyssey's already quiet and refined interior. In keeping with the Odyssey's very family-focused package, it's brimming with smart details that keep the interior safe and stress-free for parents and kids. The three rows of seating are now even better for six adults, thanks to a new second-row configuration that allows the outboard seats to actually tilt and slide outward—changing the width of the second row depending on whether there are two adults, three, or a combination of child seats there (there are now five sets of LATCH connectors, for child seats). Last year, the third row gained an inch of legroom and in some trims an armrest, while its folding mechanism got even better, with one-arm operation and no need for a power-folding mechanism. And the Odyssey was the first minivan to achieve both top five-star results in the revised federal crash tests as well as Top Safety Pick status from the IIHS. 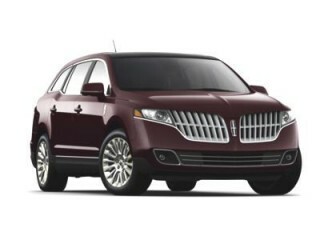 While connectivity and audio features have been bolstered for 2012, some of the other more desirable features, such as a blind-spot system, auto-leveling HID headlamps, and a hard-drive-based music system, remain the exclusive domain of top Odyssey Touring and Touring Elite models. FM-based (free) traffic updates, extended voice controls, and a stunning wide-screen entertainment system (with first-in-class HDMI input) help truly distinguish these top models, although the top Touring Elite costs nearly $45k. A minivan is by nature an aerodynamically sculpted box on wheels, but the 2012 Honda Odyssey has a little more flair than most. The Odyssey has a space-efficient, box-on-wheels design that still manages to look good from the side. Yet while the side profile is distinct, the Odyssey's front and rear styling is conservative and unremarkable. Both in front and in back, the Odyssey borrows more design details from Honda's cars than it does from its crossovers like the Pilot. Last year the Odyssey got its sleeker look, with a redesign that included a slightly more arched roofline, brightwork accenting all around, and most notably, the "lightning bolt" hump along the rear window—which adds much-needed design flair and helps, ever slightly, with visibility. Likewise, in front, the small front windows, ahead of the doors, are a functional cue shared with Honda's small cars. Moving around to the back, the rear fender is also a bit more (aerodynamically) sculpted than you might expect for a minivan. Last year's redesign brought changes inside that were more evolutionary. The instrument panel hasn't changed all that much, remaining somewhat swoopy and space-maximizing, while a "cool and intuitive" theme keeps the control layout simple, with large knobs and controls, and less of the sea-of-buttons look that other Honda and Acura dashes have resorted to. The Odyssey is the best-handling and best-steering of the (large) minivans—and a lot more fun to drive than it looks. What you'll find under the hood of the 2012 Honda Odyssey—if you even look, as we're not sure many minivan owners ever do—is a version of Honda's 3.5-liter i-VTEC V-6, here making 247 horsepower and 250 lb-ft of torque. While all Odysseys come with the same engine, top-of-the-line Touring and Touring Elite models get a six-speed automatic and the rest of the line gets a five-speed auto. With either transmission, acceleration isn't quick, but it feels fast enough; with the six-speed, the Odyssey can get to 60 mph in 8.8 seconds, according to Honda. That's technically a slight bit faster than the Sienna V-6. The downside that we've noticed with either transmission is that there's some balkiness when getting back on the gas out of a corner, or accelerating lightly. And those who live in hilly terrain might find it frustrating that there's also no way to command individual gears, just the confusing combination of an 'L' mode as well as an O/D-off button on the selector. Of course, drive with your right foot mashed to the floor and the shifts are decisive, quick, and smooth. Although the Odyssey is much more closely related to the Pilot SUV, it really handles a lot like a V-6 Accord. Engineers have managed to give this minivan remarkable cornering poise, and the suspension, which is isolated on separate front and rear subframes, somehow manages excellent body control (for such a large vehicle) while keeping out those queasy secondary motions that plague most of the SUV field, along with some minivans. What might have a big part in this is that Honda managed to cut a hundred pounds from the Odyssey with its redesign last year. 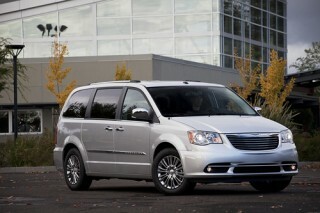 The Odyssey also steers remarkably well for such a large vehicle—or one that's not necessarily geared for performance. A variable-displacement power-steering pump is far better than the electric power steering systems in Honda's smaller CR-V or Civic, providing great weighting and even a little road feedback in the corners. The 2012 Honda Odyssey is a comfortable, refined living room on wheels—and surprisingly close, with some trick folding seats, to a cargo van when you need it. For almost any minivan shopper, interior space and versatility are what matter most—as well as comfort, of course, and any design features that help soothe children on long road trips. With respect to nearly all those items, the Odyssey is perhaps the best. It's absolutely loaded with thoughtful touches, and the seating layout has been revised yet again to make the second and third rows even better for full-size adults while maximizing the number of positions (up to eight) for kids or child seats. Last year, the Odyssey became slightly larger on the inside, with a reconfigured interior, better seats, and an improved seat-folding mechanism. Between the Odyssey's three rows of seating, the interior is now great for six adults. Thanks to a new second-row configuration that allows the outboard seats to actually tilt and slide outward—changing the width of the second row depending on whether there are two adults, three, or a combination of child seats there (there are now five sets of LATCH connectors, for child seats). The third row gains an inch of legroom and in some trims an armrest, while its folding mechanism gets even better. It's still a little more confining, for headroom particularly. While this 6'-6" editor fit well enough to be good for quick trips in the third row, I would have been happy all day in the second row. You can fold either section of the seat into the floor with a single motion, with only the firm pull of a strap. Honda didn't bother with a power-folding third row arrangement, as all the ones that it tried took longer to deploy and were unnecessarily complicated (and another power item to fix after some years of ownership). Honda's system is simple, elegant, and easy enough to do even with an arm of groceries. For those who need a more continuous cargo floor, for projects or moving large items, you can now fit two ten-foot-long 2x4 studs into the Odyssey, and of course with the second row out of the way you can fit 4x8 plywood. You'll also find plenty of spaces for smaller items, including a a media drawer with damped opening, a cooler compartment below good for several beverage containers, and a trash-bag ring—which cluttered families are bound to find useful. In front, seats are comfortable buckets with a good view outward—although we'd like a little more lateral support from them, along with more mid-back support. The Odyssey rides smoothly and is a surprisingly quiet, refined place—in part, thanks to some high-tech wizardry. Active noise cancellation and active engine mounts both help quell any vibrations from fuel-saving cylinder deactivation, as well as excess road noise. Interior materials and trims aren't in the luxury realm, but they're not bad for also being Wet Wipe friendly. 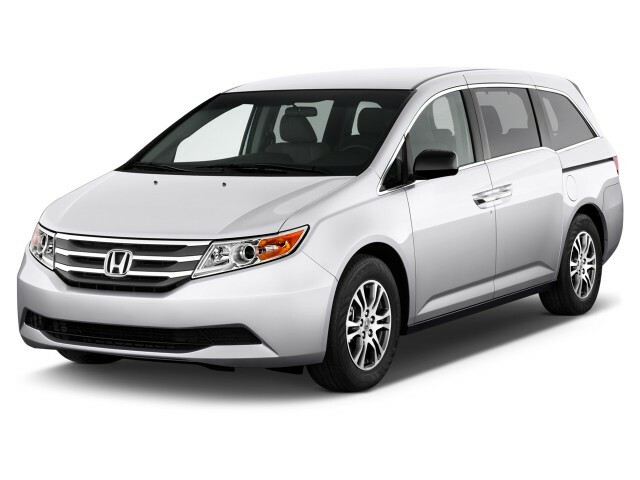 In addition to being the safest minivans as indicated by crash-test ratings, the 2012 Honda Odyssey is one of the safest vehicles, at any price. The 2012 Honda Odyssey has an impressive bragging right for safety-minded family shoppers: it's the only minivan model to have earned top five-star ratings in every crash-test category of the federal government's New Car Assessment Program (NCAP), as well as top 'good' ratings in every category of Insurance Institute for Highway Safety (IIHS) testing. In addition to the stability control, anti-lock brakes, driver and passenger front side airbags, and full-length side curtains that we've come to expect in this class of vehicle, Honda has also distinguished itself with the Odyssey in offering a class-leading six child-seat tether locations and five LATCH locations (the official clips)--enabling you to fit up to four child seats of any kind, or five in some cases. The Odyssey also remains one of the best-handling minivans in our opinion, which might allow you to avoid that accident in the first place. The 2012 Honda Odyssey offers some innovative features, but some of those—as well as many of the most useful tech and connectivity features—are reserved for top EX-L trims. 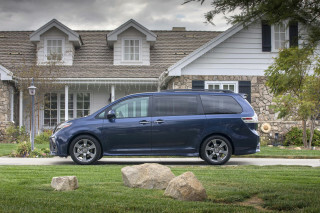 While connectivity and audio features have been bolstered for 2012, deciding on a Honda Odyssey model can be somewhat frustrating as some of the most desirable features, such as a blind-spot system, auto-leveling HID headlamps, and a hard-drive-based music system, remain the exclusive domain of top Odyssey Touring and Touring Elite models. It's more than a little disappointing that those getting an LX or EX have to do without Bluetooth hands-free calling altogether, unless they go for a typically-inferior aftermarket system. The base LX includes air conditioning with front and rear controls, cruise control, an eight-way power driver's seat, power windows, locks, and mirrors, and a 229-watt sound system with subwoofer. For 2012, the EX adds Bluetooth hands-free connectivity, plus an intelligent Multi-Information Display (i-MID) and 8-inch TFT screen, in addition to 2 gigabytes of audio storage, and a USB audio port, plus alloy wheels, heated side mirrors, HomeLink, the removable front center console, a tri-zone climate control system, and second-row sunshades. EX-L models get leather upholstery and trim plus heated front seats, an 8.0-inch screen display, rearview camera, power moonroof, cooling box, Bluetooth, an added utility tray, and many more extras. Touring Elite models, at the very top of the lineup, add a blind-spot system a 650-watt sound system with hard-disk storage, the ultra-wide-screen system, theater surround sound, HID headlamps, and a blind-spot information system. The navigation system in the Odyssey is a step ahead of those on some other Honda models--now featuring a built-in Zagat guide, a huge points-of-interest database, high-contrast VGA display, and free FM-based traffic information. Plus you can load a personal picture to use as wallpaper with the system. 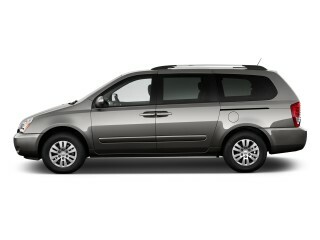 The 2012 Honda Odyssey is one of the greenest picks for carrying a large family. The Honda Odyssey got a big boost in fuel economy last year, with Honda applying its Variable Cylinder Management system across the entire lineup; from our experience, this system helps real-world gas mileage--provided your right foot isn't too enthusiastic. Odyssey LX and EX models now carry an EPA rating of 18 mpg city, 27 highway, while Odyssey Touring and Touring Elite (which have a six-speed, rather than five-speed, automatic transmission) get 19/28 ratings. That makes it best in class--on par with many V-6 sedans--and several miles per gallon better on the highway than its leading rivals, like the Toyota Sienna and Dodge Grand Caravan. Top Odyssey Touring models are better overall than the base four-cylinder Sienna. Altogether, those are impressive numbers--making the Odyssey more fuel-efficient than any other vehicle with three rows of seating and a regular, non-hybrid powertrain. great vehicle for carrying six adults. easy entry and exit. good cargo area. could use an interior that didn't look or feel like plastic. comfortable seats. 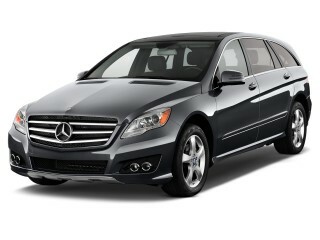 Great car for a mom with 3 boys. Easy can add or take away seats to add cargo or kids.